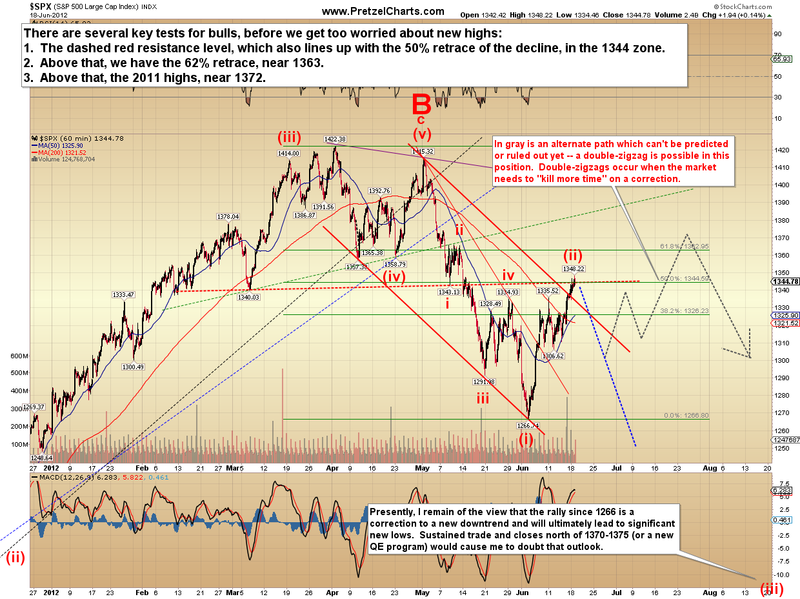 Yesterday's short-term outlook was anticipating a tag of 1348 and possible reversal; the high yesterday was 1348.22. It appears reasonably likely that there is now a complete A-B-C correction in place, though the 1-minute charts allow the potential of a slightly higher high, along with some other potentials I'll discuss in a moment. The market is a dynamic environment, and one won't last long as a trader if one is unwilling or unable to recognize and adjust to changing signals as frequently as the market dictates. I want to be as brutally straightforward as possible in this update, because I have a number of unanswered questions about the overall outlook right now. 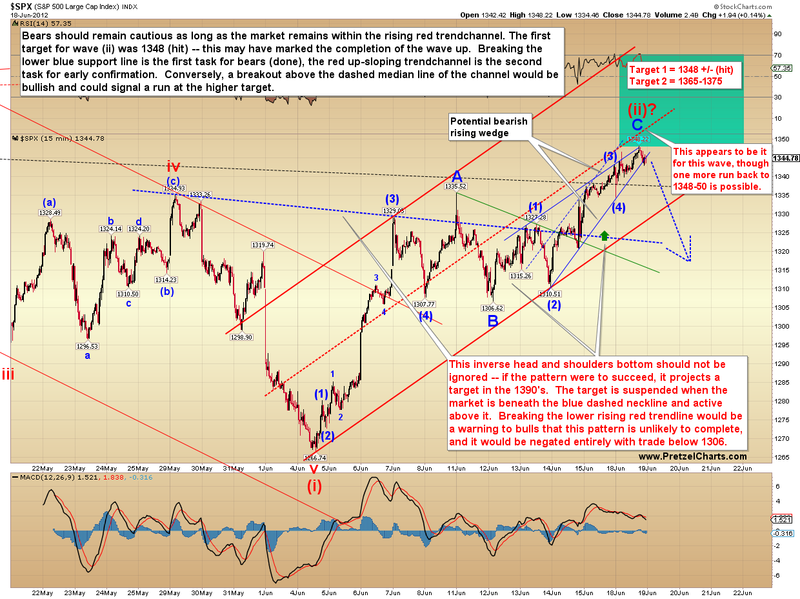 Be aware that some mid-term targets may need to be adjusted on the fly. I've been trying to keep things simple for the sake of my readers, and mainly focus on direction and short-term targets (those which apply more universally), and that has worked out well so far, as the short-term targets have been reached. But I want to convey a sense of caution in this update, because I'm seeing some new signals that are giving me pause. I'll discuss these signals in a moment. I wrestle daily with trying to convey the potentials in such a way as to not overwhelm folks, since I realize that for most people, Elliott Wave can quickly become confusing. Even when I attempt to present things as simply as possible, I find some readers still become confused. Reading certain feedback lets me know I still have work to do when it comes to communication -- though some degree of deconstruction always comes into play when communicating, and I have no control over each individual's subjective interpretation of words. I once had a reader take time out from his busy schedule of (I assume) burning ants with a magnifying glass to write an entire paragraph criticizing me for using the phrase "last gasp higher." (?) It's a thankless job some days. The above paragraph is, of course, assuming that there are new lows coming at all. With the Fed meeting coming up, one always needs to remain cynically cautious. Which brings up a recent development that's bothering me about the charts (though I'm not showing this in the charts I've drawn) -- and that's the potential of a much larger rally than I'm anticipating. The structure that's developed since June 12 is either an ending pattern, or the wind-up to a big launch higher. This is one reason why I've suggested that bears pay attention to the trendchannels. 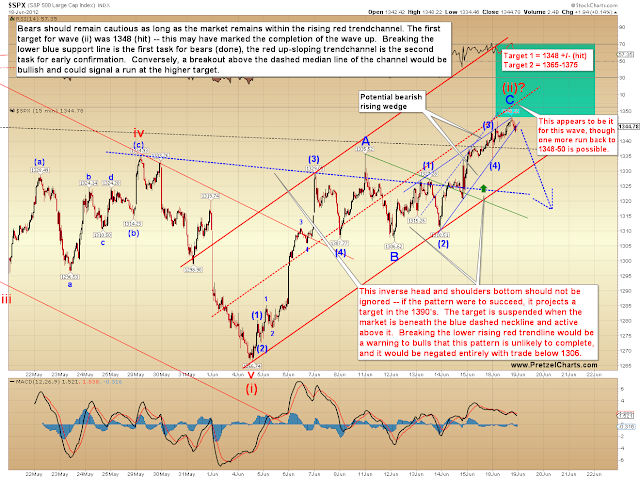 As long as the market remains within the red trendchannel (2nd chart), the potential for the bulls to wreak havoc remains. Let me see if I can help this make sense to a non-Elliottician, with the aid of the short-term chart below. I have only labeled the bearish potential here, but it is still conceivable that some of the waves labeled as "a-b" are actually additional 1's and 2's. There's no clear third wave in this mess (the third wave is almost always the longest and strongest wave) -- and that tells me it's either an ending pattern, or a wind-up to launch (meaning the strong third wave is yet to come). I realize one could look at the chart and say, "But you have red (iii) labeled, and it's the longest and strongest!" Yes, it is. But it's not a "proper" third wave -- there's too much price overlap. And it's bothering me. So please remain nimble and cautious if you are shorting this market. The majority of my readers rode the big wave down from 1400ish to the high 1200's -- things were much clearer then, and they will become clear again. If you established shorts yesterday when the 1348 target was hit: great, you're in the black already. But please maintain stops and don't be afraid to exit those positions if the move goes against you. If the market starts a solid decline in the next couple sessions, then my preferred interpretation (shown in the following charts) is probably correct, and my caution is unfounded. But it would be remiss and irresponsible not to warn of other potentials which have developed recently. 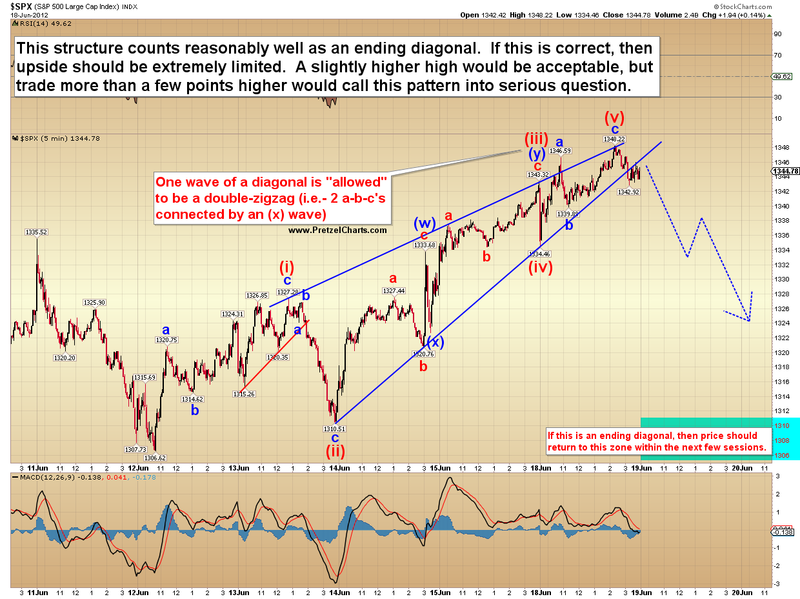 The next chart gives perspective to the chart above, and shows how it fits into the larger view of an ABC correction. And stepping out one more time-frame, on the chart below I've annotated another caution. If this is a second wave and my short-term count is correct, then it's a bit too short, and sentiment probably hasn't turned bullish enough yet. 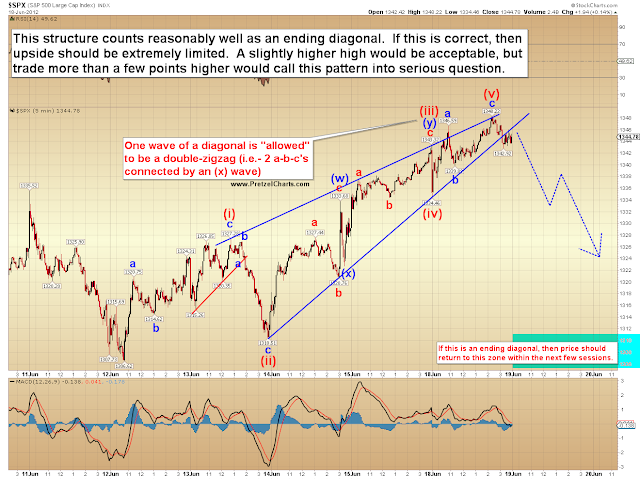 There is a pattern for such occasions, called a "double zigzag" (also referenced on the first chart) which is two a-b-c's connected together. I've drawn in a rough sketch of this pattern in black. Unfortunately, there's no way to predict that pattern in advance, it can only be addressed as it unfolds. But again: I do want to at least warn traders of this possibility. Finally, another indicator screaming for attention is the Volatility Index (VIX). VIX generally moves opposite to the market (when VIX goes down, the market is usually rallying). VIX is sitting right on a support zone, and additionally, it closed outside its lower Bollinger band on the daily chart (not shown). Usually, one could expect a bounce from VIX in this situation (along with the corresponding decline in SPX) -- but again, the market is dynamic and we have to be aware that things don't always perform the way they do "most" of the time. If for some reason VIX doesn't bounce here, it could be another warning sign to bears. 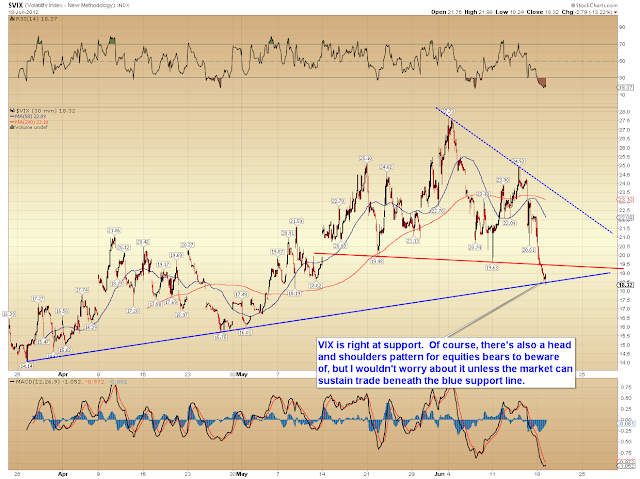 The chart also notes the head and shoulders pattern on VIX (neckline shown in red). I currently don't expect this pattern to reach its target of roughly 12, but that target is active as long as VIX is below the red neckline. In conclusion, my 1348 target was hit, the market reversed, and things may well be right on track... but I don't want readers to become complacent here, because this market is not cut-and-dried at the moment -- so I've done my best to outline the alternate possibilities. A fair number of these questions should be answered in the next couple sessions. It's always great to take low-risk trades (such as the shorts when a target is hit) -- but I would caution against getting married to positions right now. Don't be afraid to exit to the sidelines if the market isn't performing as expected. In other words: Trade safe. PL, good article. However, there is also something called "long position"... ;-) Unfortunately, I haven't seen that word in your posts in some time and I am wondering why one would short an uptrend. From a (as neutral as can be) investor perspective, one has to of course take both long and short positions. I know you are a bear (at heart), nothing wrong with that of course! !, but I think you'd reach an even much broader audience, when both suggestions for long and short positions are mentioned. Great analysis. I am posting here because my question is directly related to a chart. You have Wave A = 1267 to 1336 (69 points). How often does Wave C = Wave A? Is there another more common relationship between the two waves? Wave C = Wave A = 1375. Yessir, aware of this. I couldn't see a low-risk long setup here.